The professional communities of psychologists and child welfare specialists to a deeper, higher and more encompassing awareness and understanding of the crucial linking of caring for animals and children in human experience. The combination of careful research, documentation, and compelling narrative accounts are blended into a rich resource to help professionals and concerned citizens and parents understand how the ethics of caring are not bounded by species. Educators, clergy, coaches, law enforcement, and mental health workers, parents, students of developmental science. Frank Ascione is a professor of psychology and adjunct professor of family, consumer, and human development at Utah State University. Ascione received the 2001 Distinguished Scholar Award from the International Association of Human-Animal Interaction and the International Society for Anthrozoology, and in 2002 was selected as USU's College of Education Scholar/Researcher of the Year. Ascione serves on the Child and Animal Abuse Prevention Advisory Council of the Latham Foundation. 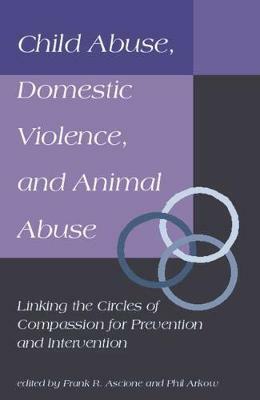 During his career, he has published several books including, Cruelty to Animals and Interpersonal Violence: Readings in Research and Application (1998), Child Abuse, Domestic Violence, and Animal Abuse: Linking the Circles of Compassion for Prevention and Intervention (1998), both by Purdue University Press, and authored Safe Havens for Pets: Guidelines for Programs Sheltering Pets for Women Who Are Battered.